The relax sofa Klas is the answer Frajumar offers to all tho- se who seek a special comfort with the highest quality. Wraparound shapes, reinforcement in the lumbar area and the soft opening of the mechanism make it a perfect sofa for the most demanding users. Reclining modules with mechanism driven by electrical engines and 0 degree wall. The engines are controlled by a hidden button, located on the side of each seat. 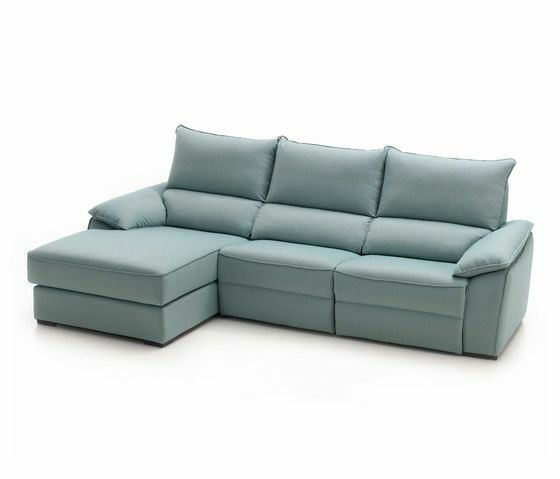 Sofa manufactured by modules. MATERIALS 1. Solid wood frame, Covered with HR30 kg/m3 foam. Suspension made with NEA elastic webbing with 10 year guarantee. 2. Seat cushion made with HR 35 kg/m3 foam plus 3cm of super soft layer. Finishes: double stitching and piping. 3. Backrest cushion and arms made with microfiber down touch (Microgel) and polyester silicone fibre. With divisions to avoid deformation. 4.Relax mechanism. Electric and manufactured in steel epoxy painted. Transformer and button control for each engine in each module. After sales service included during 2 year. Telephone line service 24h and reparation granted in 14 working days. 5. Leg of solid beech wood.